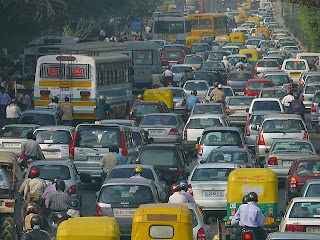 This is what traffic in New Delhi often looks like. Enough New Delhi residents are fed up with their roads being clogged by cars, that they have decided to take back the streets. Starting at Connaught Place, one of New Delhi's shopping and business districts since it was designed by W.H. Nicholls, the Chief Architect to the Indian government in the early 20th century. 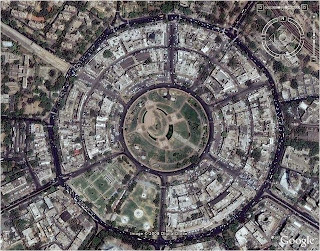 The circular layout of Connaught Place is striking, the buildings lining its streets in sweeping curves. It is a grand place. But when it's clogged with cars it's less grand - not to mention dangerous. From July 2014 onward, Connaught Place has been declared car-free every Sunday, following in the footsteps of Gurgaon, which pioneered the citizen initiative of a sustainable car-free Sunday, called Raahgiri. The first one occurred in November 2013 in Gurgaon - and it's catching on. In the first three weeks that Raahgiri day has taken place in New Delhi, attendance has grown so much that the organisers are now considering expanding the car-free zone. 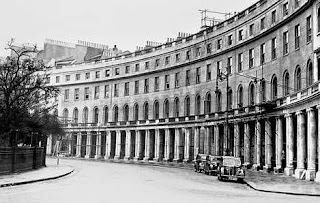 The Times of India reports: "But for the Raahgirs, more than the activities, it was the freedom to walk on the streets of Connaught Place that was important. Like Sandeep who had come in with his wife and skating enthusiast daughter from Janak Puri, told us, "We had stopped coming to Connaught Place months ago because of the traffic and the messy situation. This is the first time in years that I can actually stand on a road here and look around and enjoy the original charm of this place. This is the Connaught Place that I want to show to my daughter." "
Activities that have displaced car traffic include cycling rallies, zumba, juggling - and of course, yoga. I just love this idea. When a community has a festival, they are able to shut down the streets. So we know it's possible. Now we just have to let officials and shop owners know that it would definitely be in their best interest. Thanks for sharing!! Shop owners are always reluctant, for fear of losing business - but research has shown consistently that making a pedestrian area *increases* business.